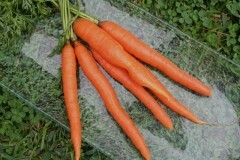 carrots are easy on the eyes. an excellent source of antioxidant compounds, the richest vegetable source of the pro-vitamin A carotenes + antioxidant compounds help protect against cardiovascular disease and cancer, and also promote good vision, especially night vision. oven stirfry chicken & shiitakes-holy sheet pan!